MALETIN TROLLEY PERFECTO PARA VIAJAR FUERA, SEGURO, DURO E IMPRESCINDIBLE PARA VIAJAR CON ARMAS. Very tough and strong case with nice trolley-system. Shaping the inner side to transport handguns is easy. I am very satisfied with the purchase. Fast delivery by DA ! I have got the case now for a month and traveld from Sweden to China and back, I use the case almost everyday on my way to and from the range. I´m very pleased with the product, I was looking for the much moore expencive Pelicase but now I see no reason to pay almost the double price...... 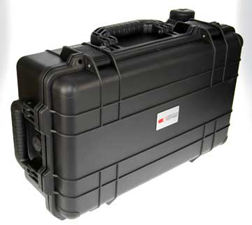 When compared with Pelicase 5110 wich is very similar the case seems equal in every aspect to a much lower cost. I highly recomend my friends to buy this product. Taking a good thing one step further, we are pleased to offer you the CED waterproof case in a new configuration which includes transport wheels and a fold-down telescopic handle. 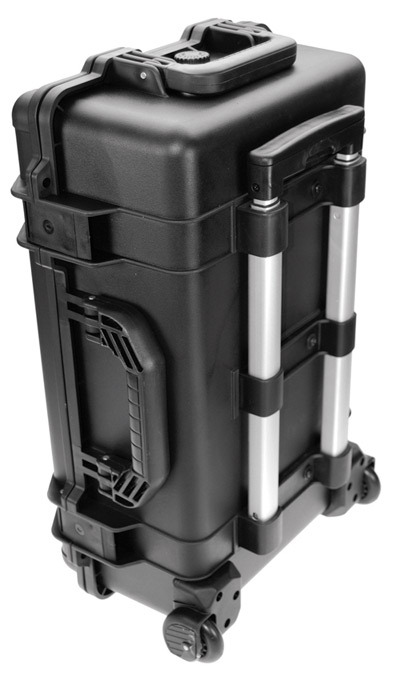 This new case is longer than even the Large model CED Waterproof case, measuring an impressive 55x33x23cm and weighing 5.1kg. 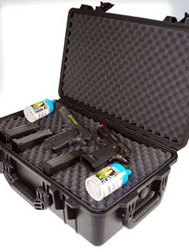 It is perfect for transporting valuable firearms, camera gear, or any expensive equipment which needs to be well protected. The new two-piece release latches make opening the closing this case easier than ever, and handy lock eyelets make it possible to use a regular pad-lock to secure the case. The wheels are perfect for indoor use, but are not designed for use off-road.